Nothing to bark home about. (What? If you’re tutting at that, then this film is not for you. If you tutted but had a cheeky little grin, then this might be). Enough hi-jinks and 3D animation to keep the children wagging their tails but it’s hardly a rollicking family movie. 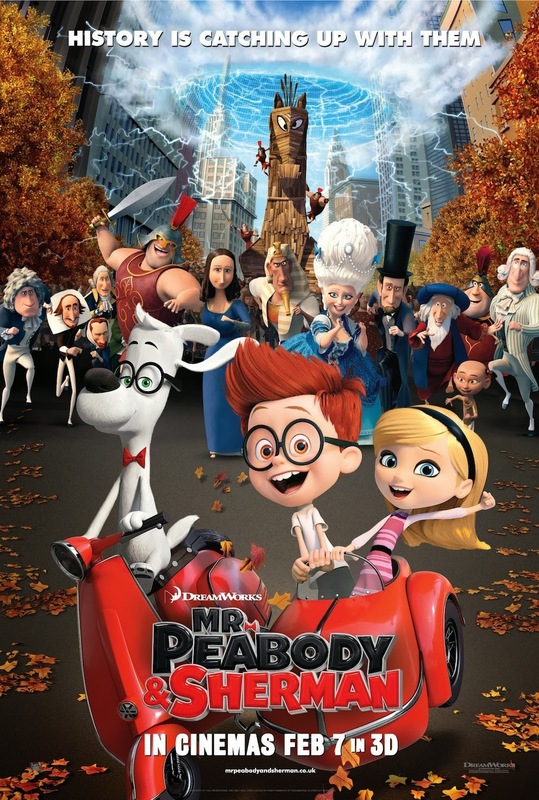 It’s not all bad and to be honest, it jumps straight into the action with Mr. Peabody (voiced brilliantly by Ty Burrell or Phil Dunphy from Modern Family BUT less annoying) making a brief introduction about his numerous achievements from birth, after being neglected for being unique (the usual spiel). His greatest challenge, however, was adopting seven year old Sherman. We join the dynamic duo on a time travelling escapade, basking it up in the 18th Century French Revolution before its inevitable uprising. It zips along, the 3D is actually quite good with the swords and spears pointing out of the screen. The one liners are guilty pleasures, silly but funny pun gags. One particular guilty chuckle was during a zany escape attempt from the guillotine that is as bonkers as the Sherlock fall. Mr Peabody delivers the punch line, “The best thing to do is be calm and keep your head”. However, this is all thrown aside as Sherman attends his first day of school. And before you know it, he’s in a fight with a bully. Twist, the bully is a girl named Penny (voiced by Ariel Winters or interestingly Alex Dunphy from Modern Family). This leads to the gruesome child protection services officer Mrs Grunion (Mom’s Allison Janney), who bears some deep resentment towards dogs owning children. She threatens to take Sherman away. In attempt to prevent the pair being torn apart (Aww. Yuck) Peabody invites Penny and her parents over for dinner. Penny and Sherman inevitably refuse to get along. That is until, against Peabody’s wishes, Sherman introduces her to the Way Back (time machine). The pod looks exactly like the one from Free Birds. This film may not be great but it’s better than that turkey (What?). However, the jokes are few and far between. And the overall story is the same old guff. The time travel sequences end up visiting all the obvious famous figures, Shakespeare (check), Van Gogh (check), Da Vinci (check) – cue a highly predictable gag about the real reason behind Mona Lisa’s smile. It seems like the movie ran out of gas by the hour mark and threw the lazy plot device of the time machine’s power being drained so they have to stop at random points of time. In all fairness, the 14th Century Florence skit with Stanley Tucci’s Da Vinci wasn’t too bad and his creepy child machine was very weird but funny. The ruse that Mona Lisa was all for tourist promotion wasn’t bad. However, there is the usual cheesy father/son/dog/pup spats and brewing, if unnecessary, romance between Penny and Sherman. OTT slapstick and silly gags. However, after the hour, the film does find another gear and revs up to a mad timey wimey finale. The Troy sequence was hilarious with the testerone-pumped dimwits led by Agamemnon, voiced expertly by Patrick Warburton (Joe from Family Guy). The comparisons between their weird family upbringings was a surprise and one for the adults. “Don’t get me started on Oedipus. You do not want to go round there at Thanksgiving”. The timey wimey stuff made it more interesting once they start breaking up the space time continuum and the past goes back to the present but it all got ridiculous with the inevitable cheesy, corny happy ending. Watchable, brilliant visuals, if predictable guff. Shame considering the talent; I mean come on, Mel Brooks, Dennis Haysbert, Stephen Colbert, Leslie Mann! Enough for the little ones but the bigger kids will be fidgeting . . . towards the exit door.